QUESTION: When I watch my TV, the picture sometimes jumps. How do I test it to see if it’s the TV or another issue? If your TV picture is jumping while watching cable, satellite, or streaming, there are a few things you can check. 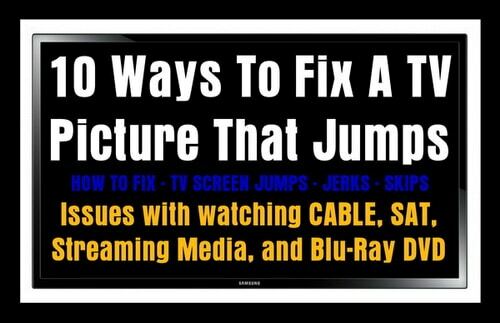 See below for the best solutions to fix a TV where the picture seems to “jump” or “skip”. Television Picture Screen Jumps Answer 1: To be sure it is not the TV, Factory Reset the TV in the TV SETTINGS MENU. This will erase any incorrect screen tuning or incorrect picture adjustments that may have caused the TV screen to jump. Also unplug the TV from the wall and plug it back in after 5 minutes. Television Picture Screen Jumps Answer 2: If screen jump is happening with ALL CABLE, SAT, Streaming Media, and Blu-Ray DVD (basically anything you watch) then your TV itself may need to be fine tuned. Go into the MENU of the TV and find where to adjust the picture tuning and the fine tuning to attempt to fix the problem. Television Picture Screen Jumps Answer 3: If screen jump is happening with JUST CABLE, turn the CABLE Box OFF then back ON. Check all cables and HDMI wires. Reset the CABLE Box in the CABLE MENU settings. Note: Cable may be partially out or work may in your area, call your cable company to be sure. Television Picture Screen Jumps Answer 4: If screen jump happening with JUST SAT, turn the SATELLITE Box OFF then back ON. Check all cables and HDMI wires. Reset the SAT Box in the SAT MENU settings. Be sure SAT dish is pointing in the correct position and there is nothing blocking its view of the sky. Television Picture Screen Jumps Answer 6: If screen jump is happening with JUST Streaming Media, try switching from WIFI to plugging in an Ethernet Cable. The WIFI signal may not be strong enough to stream the content. Switching to an Ethernet Cable eliminates WIFI to your streaming device and should stop the “skipping” or “jumping” on the TV screen. Television Picture Screen Jumps Answer 7: If screen jump is happening with JUST Blu-Ray DVD Player, turn the Blu-Ray DVD Player OFF then back ON. Check all cables and HDMI wires. Reset the Blu-Ray DVD Player in the Blu-Ray DVD Player MENU settings. Check Blu-Ray Disk for scratches or defects. Television Picture Screen Jumps Answer 9: Try changing the HDMI CABLE. Disconnect the HDMI CABLE on the component or box you are having issues with. Disconnect the HDMI CABLE from the TV. Set the HDMI CABLE aside. Get another HDMI CABLE and connect it to the TV and the component or box. Television Picture Screen Jumps Answer 10: If screen jump is happening with ON DEMAND or RECORDED shows from your DVR, turn the DVR OFF then back ON. Check all cables and HDMI wires. Reset the DVR in the DVR MENU settings. Note: If watching IN DEMAND, sometimes the picture may jump or skip depending on connection and speed or quality of streamed movie or show. Previous post: Refrigerator Is Freezing Everything – What To Check – How To Fix? Next post: Car Key Remote Is Not Working – Which Remote Control Battery Do I Need?